SIR JOSEPH ALSTON, BART., was a successful merchant businessman, created first a Knight, and then elevated to the higher rank of Baronet on 20th January, 1681. His first wife Mary Crookenberg, was one of the daughters and co-heirs of a wealthy Dutch merchant, of Bergen-op-Zoom, in the province of Brabant. Her dowry was L12000. His second wife Anne was also women of considerable personal means. He also purchased the estate of Bradwell Abbey, co. Bucks., two miles south of Wolverton, and a quarter of a mile west of Bradwell. The Abbey was formerly the Benedictine Priory of St. Mary, and was partly rebuilt as a mansion. It had a moat and a long avenue of trees. It is now a farm house, and the estate belongs to the Mercers' Company. Joseph was mentioned for L5 in Isaac Alston's will, 20 May 1625, he was aged under 21 years at that date. Priory of Bradwell - passed by purchase to the Lawrence's in 1647 and from them in 1664 to Sir Joseph Alston bart then of Chelsea who made Bradwell Abbey his residence. After his death it was successively in the families of Fuller and Owen. Bradwell Bucks. Monument for Sir Joseph Alston of Bradwell Abbey (in the adjoining parish of Wolverton) who died 1688. The demesne of the manor of Houghton was sold to the Alstons and by them about the year 1699 to the Hanslapes. The residence of Sir Joseph Alston, the first Baronet of the Chelsea line and his immediate successors, is said to have been the old time residence of Sir Thomas More, the famous Chancellor of Henry VIII's reign. In this case Beaufort House would be its original name, and it would be from here that the upright Chancellor took boat to the Tower. The present Apothecaries Garden is said to have formed a part of the gardens attached to the house.
" In Alfred Beaver's Memorials of Old Chelsea is a note that during the week commencing May 30th, 1664 some Chelsea fishermen caught, it appears, off what is now known as Cheyne Walk, 172 pounds of salmon, which they sold to the Duchess of Ormond, Lord Cheyne, Squire Alston (afterwards Sir Joseph) and others at fourteen to eighteen pence per pound." Bill, 21 May 1650, by John Hallam, citizen and draper of London, v. Joseph Alston and Mary Croukenbery. The defendants (who are not described) were appointed executors of her will by one Clare Buck, widow of Robert Buck, citizen and draper of London, complainant's aunt, who was near one hundred years old at her death; they have possessed themselves of a considerable part of her estate, and defraud orator. This is the bill, dated 25 November 1650, to which the answer is filed in Reynardson, 6/189 (q. v.). Mary Brakenbergh and Joseph Alstone are executors of Clare Buck, late of London, widow. Of the bond in dispute orator was promised an indemnity: and he has really no responsibility whatever therein. He prays defendants may be restrained from demanding payment. SENTLEY v. ALSTONE & others. Answer, 31 May 1651, by Joseph Alston, one of the defendants to the complaint of Robert Sentley, esq. Defendant is executor of one Clare Buck, widow, who died about February 1648/9;. He is satisfied the bond given her by the complainant and others was not paid during her lifetime. Bill, 7 May 1653, by John Southwood the elder of London, merchant, v. Thomas Burton, Joseph Alston and Henry Hickford.
" One Joseph Alston " is made party to this suit, as having cognisance of certain bonds &c. given on the marriage of complainant's daughter Hannah to Thomas Burton, and now combining with said Burton to complainant's disadvantage. In his answer Alston says he knows nothing whatever of the transactions had in connection with the said marriage. Burton was indebted to him in over L400, for divers pieces of Norwich stuffs supplied to him by this defendant. He attached the complainant's goods as a debtor of the said Burton. Bill, 6 November 1658, by Francis Lenthall of London, merchant, v. Joseph Alston of London, merchant. Relates solely to financial transactions between the Parties, and giving no personal details whatever. Bill, 15 December 1658, by John Wiggott of London, merchant, v. Francis Lenthall and Joseph Alston of London, merchants. This suit relates merely to bills and bonds, and contains no personal information whatever. See as above. Bill, 6 February 1671/2, by Richard Maryott of the parish of St. Clement Danes, Middlesex, Esq. v. Richard Chandler, Joseph Alston, and Framlingham, Bussingborne, Charles, Mary and Sir John Gawdy. Bill 13 May 1672, by Joseph Alston the elder, of London, Esq. v. Dame Priscilla Rider and Thomas Rider. One Wm. Courteene late of London, Esq. and afterwards Kt., borrowed a sum of money from Clare Bucke, late of London, widow, decd., who was aunt to Mary, your Orator's wife, late deed. The said Clare Bucke made complainant her executor. 30 Dec 1681 King's Warrant Book VIII, pp. 334-5. Money Book III, p. 256. Source: The Catalogue of The National Archives From: 'Entry Book: December 1681', Calendar of Treasury Books, Volume 7: 1681-1685 (1916), pp. 353. URL: http://www.british-history.ac.uk/report.aspx?compid=83825 Date accessed: 05 July 2012. This is a much more interesting document than the usual run of Wills (see below), revealing as it does many pleasing traits of the aged merchant baronet's personality and a deep and devout faith in his religious belief. It begins, " In the name of God Amen. I Sir Joseph Alston of the parish of Chelsea in the County of Midd. Bart. being. in good health of body and of perfect and disposing mind and memory thanks be therefore given to Almighty God and calling to mind the uncertainty of this present life that I am borne to change the same as my former deare wife hath done. And alsoe that as the change and death of this life is most certaine to every liveing creature so the time to us is most uncertaine as a signall proofe thereof the Lord hath manifested unto mee in my last most deare and well beloved consort. Giveing thankes to God for all his benefitts bestowed upon me in this life doe make and ordaine this my last Will and Testament in manner and forme following that is to say ffirst and principally I commend my Soule into the hands of Almighty God my Creator the ffather of our Lord Jesus Christ and to Jesus Christ my onely Saviour and Redeemer by whose death and passion I faithfully beleive to bee saved and to the Holy Ghost the Comforter of his elect three persons and one invisible imortall onely wise God blessed for evermore before Whome I shall at the generall day of judgment appear with joye in the Robes of Christs Righteousness through whose meritts I beleive my sinns shall not be imputed to me and by whome I hope and believe I shall enter into that everlasting Kingdome of Heaven with the faithful members of that triumphant church whereof Jesus Christ is the head." After this pious but lengthy confession of faith, Sir Joseph orders his body to be buried in the Parish Church of Chelsea, "in the same place where my deare beloved wife lyeth buryed, my coffin to lye upon her coffin under the pew where we alwaises satt together in the Chancell and to be buryed in the coffin which I have provided and which is now in a closset at my dwelling house at Chelsea." Sir Joseph died possessed of a very considerable estate, out of which he made many bequests to kinsfolk and dependents. Among the more interesting are those of his great silver Bason and Ures, his two silver flaggons, one paire Silver Candlesticks the best paire, his own Watch his Seale gold ring and his Character Bible writt" 1 with his own hand to his son Joseph, also to the same son after his (testator's second) wife's decease the use of his great necklace of pearls for life, and then to Joseph Alston his grandson (Joseph's son). To Mary, wife of his son Isaac, his "greate Diamond Jewell" The rent of a certain house he orders to be distributed among his poor kindred as his executors think fit, which he says he does " In token of my thankfulness to Almighty God who did blesse extraordinarily my poore endeavours in the aforesaid parish of St. Edmond's the King where through his mercy and goodnesse I gott my estate. And I doe order and appointe that my said executors shall keepe a bagg on purpose to putt the rent of the said house in and not to make any other use of it. Sir Joseph desires Dr. Littleton to preach his funeral sermon upon the same text he preached upon at his former wife's funeral, i.e., Acts xiii 39, with L5 for mourning and L5 for his sermon. Not more than L300 to be spent on his funeral for rings, mourning, and other charges. He appoints his sons Joseph and Isaac executors, enjoining " them to be very carefull and faithfull in the performance of this trust which I repose in them as they will answer for it at the great day of account." 1 The "Character Bible" is an interesting relic of the old merchant baronet - a copy of the holy scriptures written entirely by him in shorthand and handsomely bound in leather with engraved silver clasps - Lionel Cresswell in 1898 discovered it in the possession of Sir Joseph's descendant, Mr Augustus J C Hare . And I doe hereby revoke adnull and make voyd all former Wills And doe declare this to be my last Will and Testament In Witness whereof I have hereunto sett my hand and Seale this Seaventeenth Day of March in the first yeare of the Raigne of our Soveraigne Lord James the second by the grace of God of England Scotland ffrance and Ireland King Defender of the ffaith etc Anno Dni one Thousand Six Hundred Eighty foure. Bann: Maynard, Jo Preston, Will Milman, Nath: Gifford Cl. to Mr Milman. There is a note in the the margin of the Will recording the grant of letters of administration (with Will annexed) 14th of April 1720 to Mary widow of Isaac Alston the younger of the two sons and executors named in the will both being dead and the estate not yet wound up. Sir Joseph Alston Knt. and 1st Bart. of Chelsea (died 1688). Granted with will annexed 14 April 1720 to Mary widow and administratrix of Isaac Alston one of the executors and residuary legatees named in the will. The priory of Bradwell adjoining to this parish, the site of which is now deemed extraparochial, was founded in the reign of King Stephen, for black monks, by Manfelin, Baron of Wolverton: it was dedicated to the Virgin Mary, and was originally a cell to Luffield. In 1526 it was given with other small monasteries to Cardinal Wolsey; after his attainder, the king granted it with the manor, in the year 1531, to the prior and convent of Sheen: the site was granted after the reformation, to Arthur Longueville esq. From the Longuevilles it passed by purchase to the Lawrences, in 1647; and from them, in 1664, to Sir Joseph Alston bart. then of Chelsea, who made Bradwell Abbey his residence: after his death it was successively in the families of Fuller and Owen. About the year 1730 the Bradwell Abbey estate was purchased by Sir Charles Gunter Nicholl, K.B. whose only daughter and heir married the late Earl of Dartmouth: it is now vested in their son, the present earl. The site of the abbey, of which there are no remains, is occupied as a farm-house.
. . . . . Sir John Lawrence, the purchaser of Bradwell, sold it in 1666 to Joseph Alston of Chelsea and his son Joseph. The elder Joseph was created a baronet as of Chelsea and Bradwell Abbey in 1682, and died in May 1688, his son Joseph, who had been sheriff in 1670, and who succeeded him, dying in March of the following year. His son, the third Sir Joseph Alston,who was likewise Sheriff of Buckinghamshire in 1702, made a settlement of the manor on his marriage in1690 with Penelope Evelyn, with whom he dealt with the manor in 1705, and again in 1713, when their son, the fourth Joseph Alston, was joined with them. The third baronet was succeeded in 1716 by his son, the fourth Sir Joseph, who immediately sold Bradwell to John Fuller . . . . .
From: 'Parishes : Bradwell', A History of the County of Buckingham: Volume 4 (1927), pp. 283-288. URL: http://www.british-history.ac.uk/report.aspx?compid=62585 Date accessed: 25 June 2013. Precis of Will of Hannah Wallin alias Poulter of St. Andrew Undershaft, London, spinster. To be buried at St. Mary at Hill where my brother John Wallin alias Poulter is buried. L10 to Thomas Poulter now in Va. or overseas, brother of Mary Poulter who is daughter of my cousin John Poulter of Hitchin, Herts. Other principal bequests to: Mr. Joseph Alstone of London, Norwich merchant, Mary his wife and their children Joseph, Edward, Isaac and Clare Alstonc; Mr. Edward Alstonc; John Baldridge; my kinsman Thomas Hunt and his children Thomas and Hannah Hunt; the son and daughter of my cousin Isaac Poulter of Hitchin, deceased, whose names I know not; the poor of Hitchin where I was born. Execs: Joseph Alstone Sr. and Mary his wife. Wits: Thomas Goodwin, scrivener, and Timothy Howford. Pr. 7 Aug 1663 by Joseph Alston. (PROB 11/312/112). 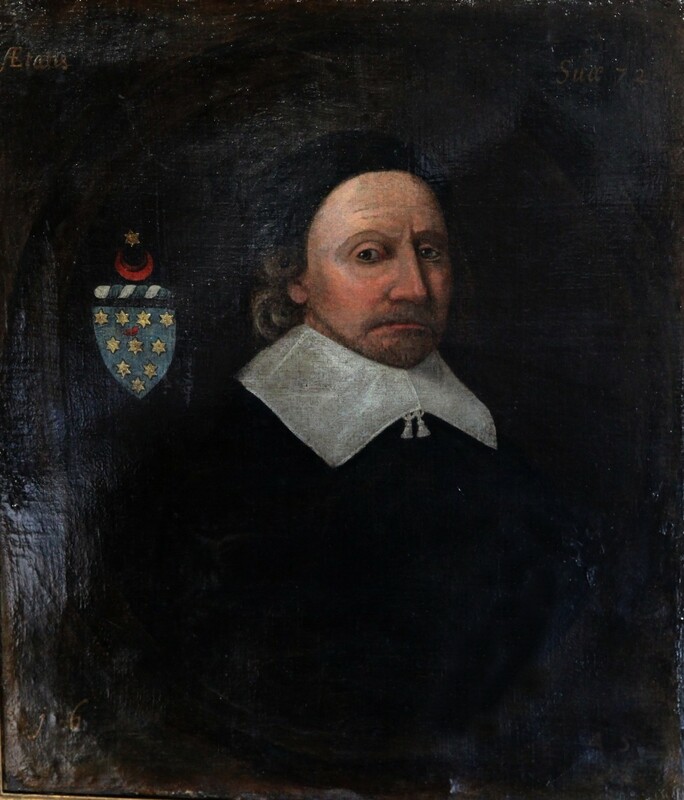 Sir Joseph & his family appear to be executors & beneficiaries of Hannah Wallin's Will of 1662. 1. 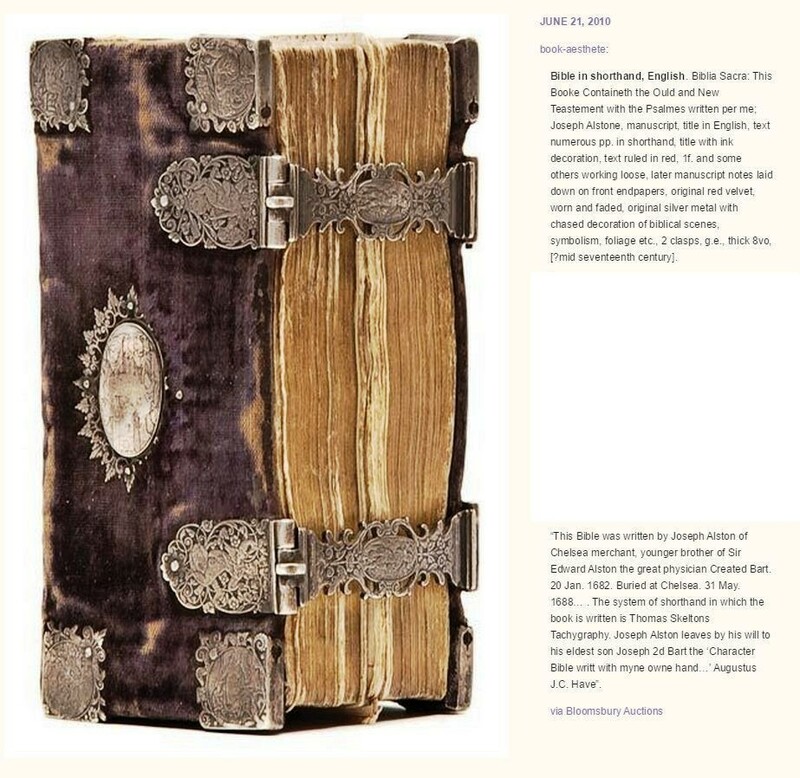 Sir Joseph Alston's Bible. This "Character Bible" is an interesting relic of the old merchant baronet - a copy of the holy scriptures written entirely by him in shorthand and handsomely bound in leather with engraved silver clasps - Lionel Cresswell in 1898 discovered it in the possession of Sir Joseph's descendant, Mr Augustus J C Hare . 2. Sir Joseph Alston & Family: Boyd's Inhabitants of London. 3. Joseph Alston: Cloth Seal impressed with Alston Crest (19mm) found in Thames, c17th Century. A good match has been found for these arms by Michael Yeti Yates, "I think it could be a merchants seal prehaps for Joseph Alston. With the link you gave me on facebook and the other one on your website found by mudlark,you can get the initials I and maybe an A from the pair either side of crescent hence James Alston. The Alston arms are the same as the seals and with the cadency of this branch you get a crescent and star above the shield. 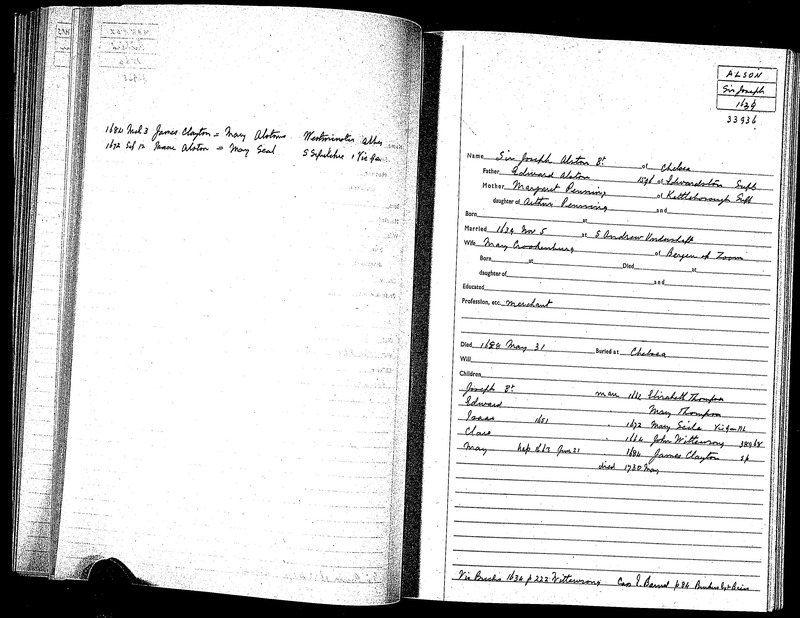 Joseph moved to Chelsea London and married the daughter and coheir of a Mr Crookenberg a Dutch merchant with whom he got the large sum of twelve grand. One link I did find says he was a successful merchant businessman."